Ingenious Modifications Provide Quick, One-Handed Access for Easy, Safe Lens Swapping. Spider Holster, (http://www.spiderholster.com) a company specializing in unique holster-style camera carrying solutions for photographers, today announced the launch of its newest accessory, the SpiderPro Large Lens Pouch. Designed for the Pro-grade 70-200 mm zoom lenses with the hood attached, the pouch’s unique design provides superb quick-draw accessibility while maintaining optimal lens protection. All purchases will also include the Spider Monkey accessory holster (a retail value of $20.00), which is fully compatible and clips to the pouch exterior. Ideal for photographers that are looking to maintain a hands-free workflow while eliminating the tangle of shoulder bags and neck straps, the SpiderPro Large Lens Pouch includes some ingenious modifications on traditional top-load lens cases. To improve accessibility and enable swapping lenses safely with one hand, the SpiderPro Large Lens Pouch features a water resistant vertical zipper that runs down the middle. Where traditional lens pouches barely allow enough clearance to wrap fingertips around the large diameter of the lens, the expandable mouth of the Spider Holster pouch enables the photographer to comfortably reach all the way in and take a firm grip of the lens at the mid-section. This expandable zipper opening also allows for a much easier insertion of Pro lenses with the hood attached, as the photographer no longer needs to reverse the lens hood or change the lens’s configuration. Included with the Large Lens Pouch is the Spider Monkey accessory holster, which is specially designed to safely clip to the outside of the pouch. The photographer can then expand their carrying options by quickly attaching all Spider Monkey accessory line offerings (light meters, speedlights, battery packs) and future items such as lens pouches, rain covers and more. The SpiderPro Large Lens Pouch also provides a unique solution for the rear lens cap, saving time and hassle when exchanging lenses while keeping the rear lens cap secure while not in use. With a secure Velcro attachment point, the SpiderPro pouch easily hangs from any belt, allowing for rotation when not in use. The modular nature of the solution means photographers can quickly scale the carrying system up and down to meet their gear needs for any shoot. Crafted using both tough Cordura and flexible Neoprene, the pouch also offers flexibility and strength to safely carry and accommodate various lenses. The base SpiderPro Large Lens Pouch, which includes a Spider Monkey accessory holster clip, will carry an MSRP of $75.00. The product will be available for direct purchase through the company website, and at Spider Holster authorized dealers. For further details and a full list of Spider Holster products, visit http://www.spiderholster.com. Founded by professional photographer Shai Eynav, Spider Holster designs and builds unique camera carrying solutions for photographers. 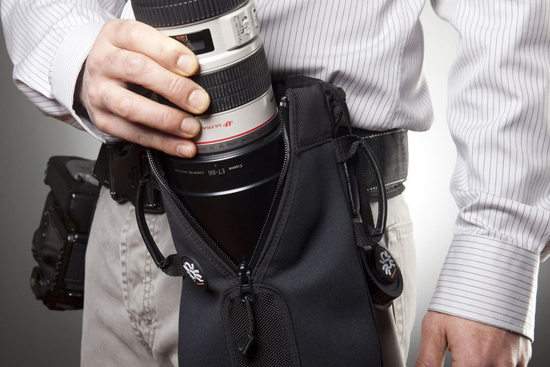 The company’s namesake SpiderPro holster system has quickly become a trusted tool for photographers looking to protect themselves against the neck, shoulder and back strain which often accompany traditional camera straps and shoulder bags while providing quick-draw access and a secure attachment point for even the heaviest pro-DSLRs. More information about Spider Holster and its latest offerings can be found at: http://www.spiderholster.com.